Mike Byers' magazine, Mint Error News, is published free on the Web on a quarterly basis. The magazine, which frequently boasts well over 100 pages, is loaded with photos and facts about error coins, how they happen, and what they're worth. 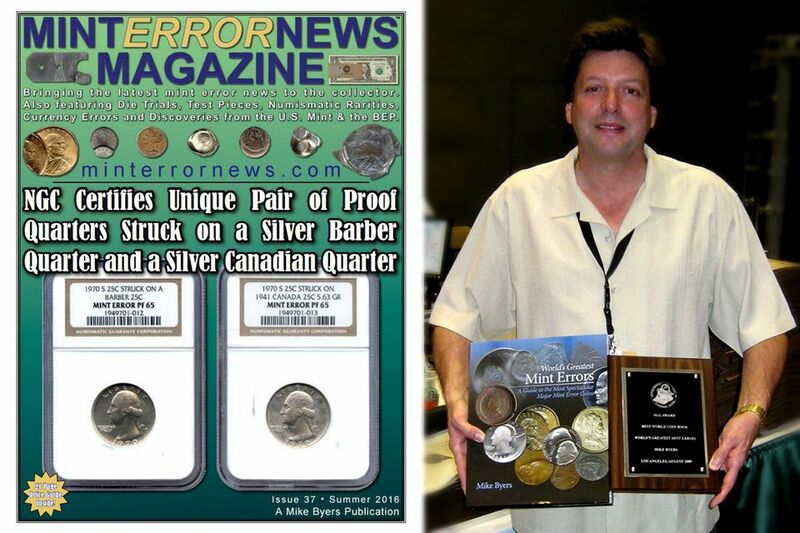 Byers is also an award-winning numismatic author. He published his first book in 2009 titled World's Greatest Mint Errors and the book received the NLG Award for Best World Coin Book. This book combines stunning imagery with the most accurate information available to provide anyone interested in mint errors with the latest information on mint error coins from the United States and around the world. Additionally he has appeared on various media outlets commenting on error coins such as the unique 1970-S Proof Quarter that was struck on a 1941 Canadian Quarter. In addition to bringing these famous error coins to market, Byers is credited with the discovery of dozens of other major minting errors, including two-headed and two-tailed coins from national mints all over the world. Mike Byers loves to travel to coin shows to meet and trade with collectors. He always has a spare moment for the newbie, happy to explain how a certain coin got the way it did, so if you have some weird coins in your collection that might be mint errors, Mike Byers is the person to show him to. He sets up his table at most of the major coin shows in the U.S. You can contact him through his Web site to find out where he will be soon.